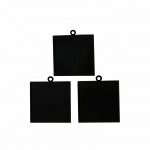 You can create the most beautiful Pendants with these Black Plated Jewelry Findings especially when you apply the new and innovative Gem Particles with 3D Crystal Lacquer Clear. 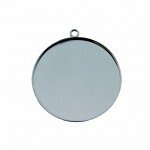 These high quality Jewelry Finding are reasonably priced, White Brass Plated gentle to your skin, and simple design to give you the freedom of enhancing your creativity. These gorgeous Zinc Jewelry Finding will bring you the classy and warm feeling to wear. You can decorate with our 3D Crystal Lacquer Pearl Color - Swirl Technique, Gem Particles with clear 3D Crystal Lacquer, or even install natural Gem Stones.